This weapon was developed in 1860 by General Origen Vandenburgh of the New York State Militia. After failing to sell it in England he sold it to the South, despite his position. The Muzzle view shows the multiple barrels, in this case 85 rifled bores of .50 calibre. 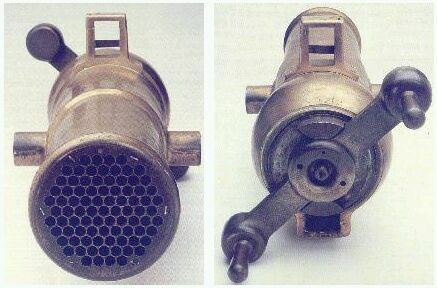 When the breech was screwed home, it forced the individually loaded rounds into an air tight seal with the weapons firing chamber. All the barrels were fired simultaneously by means of a percussion cap located in the centre of the breech handles.